After trying to use pistachios as the nut in the asparagus pesto that I made recently I was hooked! The pistachios worked really well in the pesto and I wanted to try making a more generic pistachio pesto. I decided to start with the classic basil pesto and just use the pistachios as the nut. A trick that I have learned about basil pesto is that adding a bit of spinach helps keep the pesto nice and green and I felt that a pistachio pesto should be very green so I added some. The pistachio pesto turned out great! It was nice and creamy and full of fresh summery flavours. The chopped pistachio garnish also added a nice contrasting texture. One of the reasons that I like making pestos so much during the summer is that they are so easy to make and they always taste great. If you have some pesto on hand you can easily make a quick, light and fulfilling pesto pasta meal in the time that it takes to cook the pasta. Pesto pastas are perfect for warm summer days when you just don’t feel like messing around in the kitchen. Pesto also freezes well so if you don’t use it all you can freeze the rest for later. Of course pestos can be used for much more than just pastas so I rarely have any left over. Cook the pasta in well salted water as directed on the package. When the pasta is cooked to al dente drain the pasta water reserving some of it. Pour the pasta back into the still hot pan, add the pesto and enough of the pasta water to make a smooth sauce that coats the pasta. Serve garnished with parmigiano reggiano and chopped pistachios. Take a look at the Presto Pasta Nights roundup on Sidewalk Shoes . I love the idea of pistachios in pesto. Kevin as usual a truely delicious looking dish… well done. We love pistashios so will definately be giving this a go!! I agree with everything you said about the advantages of pesto pasta. I particularly like the idea of pistachio. Sounds like a fantastic pesto! I agree, it's perfect for summer! This looks delicious! I haven't made my own pesto yet, but hope to this summer. I'll refer to this post! That's a great idea, I bet the flavors are awesome together. 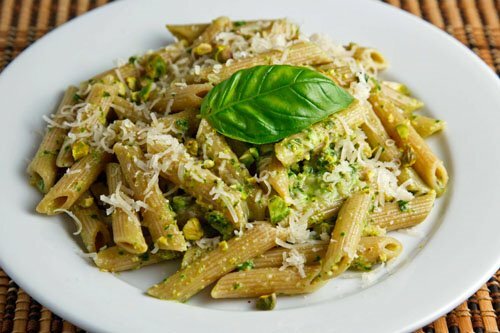 Pesto pasta is definitely one of my favorite quick lunches…must try this one with pistachios! It sounds fantastic! I love this idea! Very neat and simple. Delicious, too. That pesto must taste awesome! A wonderful pasta dish! Great idea to stick to the green theme!! I like the addition of the spinach…I think it also stretches the recipe somewhat!! Yep. Used pistachios in my pesto before. Love it. Yum! Pistachios are one of my favorite nuts and I've been meaning to use them in pesto. Thanks for the reminder, this looks great. I think I'm going to make some of this in bulk so that I can store it in my freezer for winter. I want to have as many pestos as possible to get me through the year! Great tip about adding spinach to this or basil pesto. I'd imagine that this pesto has a rich, nutty flavor. Nice alliteration 🙂 I love pesto– never tried it with pistachios though! I love the sound of this pistachio pesto. I need to make this asap! Thanks, kevin! I just want to make all of your vegetarian dishes. You never fail to please! I love pistachio and pistachio pesto sounds wonderful! My family loves pesto pasta! I will have to try it one night. Thanks! Pistachio pesto seems very nice option if one is bored with the regular pesto. As usual your penne looks really delicious. Thanks for sharing this awesome pesto with Presto Pasta Nights. That's looking mighty fine. You'd be surprised how nuts can make a dish very filling. Kevin, you have one of the best cooking blogs out there. Amazing recipes. Precise directions. Not a lot of fluffy chatter. Thank you so much. I really appreciate what you do. Oh, and this pesto is fantastic – just made it. Have a wonderful 2010! I absolutely love pesto sauce. Your photos are awesome. Here's link where a buddy used pistachio pesto with goat cheese and mushroom ravioli. Made a double batch of the pistachio pesto today and it was amazing! Combined it with some Gruyere cheese, spinach, and grape tomatoes to make a heavenly panini sandwich. As always, thanks for the great recipe! Looking forward to tossing the leftover pesto with some pasta tomorrow. Muy buena esta receta para hacer el pesto de pistachos! !